Prime Minister Stephen Harper: "We are not going to ever defeat the insurgency"
Harper says he supports President Obama's "renewed commitment to Afghanistan"
(CNN) -- U.S. and NATO forces are engaged in a futile war against the Taliban insurgency in Afghanistan, Canada's prime minister said. 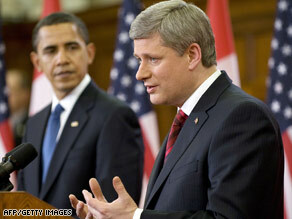 Canadian leader Stephen Harper says he backs President Obama's "renewed commitment to Afghanistan." "We are not going to ever defeat the insurgency," Stephen Harper told CNN's Fareed Zakaria in an interview that aired Sunday. "Afghanistan has probably had -- my reading of Afghanistan history -- it's probably had an insurgency forever, of some kind." Harper's blunt assessment comes as nearly 2,800 Canadian forces are fighting in Afghanistan. The country's parliament has voted to pull them out by 2011. Harper spoke with Zakaria last week after a visit by President Obama, who made Canada his first foreign trip since taking office in January. Obama has said Afghanistan is the central front to the U.S.-led war on terror. The Pentagon is in the process of sending an additional 17,000 troops to Afghanistan, bringing the total there to 55,000. Harper told CNN that he supports Obama's "renewed commitment to Afghanistan" but said he would not recommit any more Canadian troops until there is a clear plan for leaving Afghanistan. "What has to happen in Afghanistan is, we have to have an Afghan government that is capable of managing that insurgency and improving its own governance," Harper said. "If President Obama wants anybody to do more, I would ask very hard questions about what is the strategy for success and for an eventual departure."